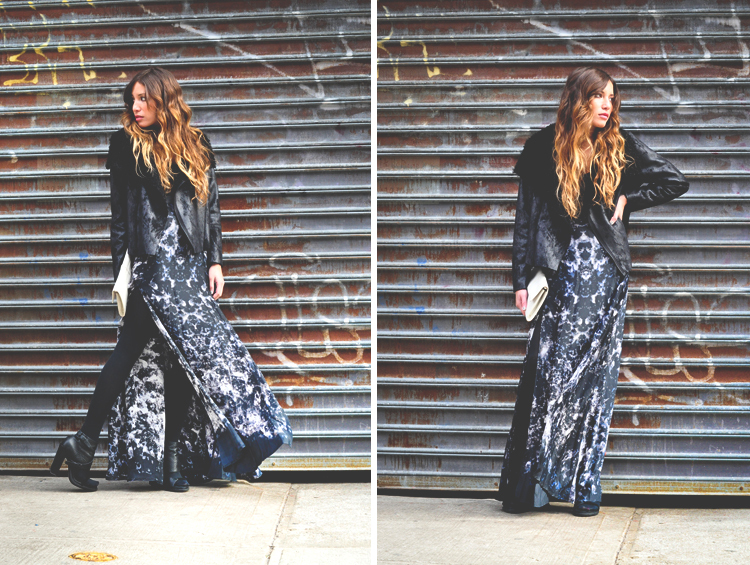 Simply Vera Wang shearling jacket (similar here), Thrifted Stylestalker dress (how cool are all their dresses though? ), Alexander Wang platform sandals (also worn here), Vintage clutch (similar here), Hue tights. I really do love it when Lauren has a semi-fance event that she needs to attend. One, she typically buys a new dress for the occasion (which by extension means a new dress for me that I get to borrow later) and two, we get to shake up the blog a bit since we're typically posting more casual, day-to-day looks. My only regret about these pics is that you can't see the top of the dress - it's leather and strapless with a sweetheart neckline and it's unbelievably flattering. Lauren took this dress out for a spin to an engagement party, keeping modestly warm in a cropped shearling coat. Notice how the texture of the jacket matches the paint splattered print on the dress? With her, nothing is ever accidental. PS. We're on Google+! Like most people we're still trying to figure everything out but so far loving the fresh layouts >> Come hang out with us! I absolutely love this look! That dress is beautiful! OOO that dress is amazing! the print and the flow. Fantastic. Plus I love Stylestaker. Great find! I love this outfit- that dress is simply stunning! Looking fab. And your manicure is super cool. This is adorable, stunning outfit, it fits for you! I've just discovered your blog through ASOS. This outfit is amazing! OMG, You look STUNNING!! I love eeeeeeeeeeeeeeeeverything: the dress, the jacket, your hair, etc. You just look so so gorgeous! I love your look. So great with the dress and the shoes. Love love love this look. That dress is KILLER...loving all of it. love that maxi! the acid wash looks great! Such a great look! I love how everything, even down to the nail polish, goes with the outfit! Hope the party was a blast!! Love this look! Beautiful pictures! Love your dress and jacket. Great look! It does look like a great dress, I love full length dresses and the split still keeps it contemporary. please show us the top as soon as it gets warmer! LOVE, LOVE, LOVE this look!!!!!! I have a pair of Michael Kors pants with what looks like the same exact print. 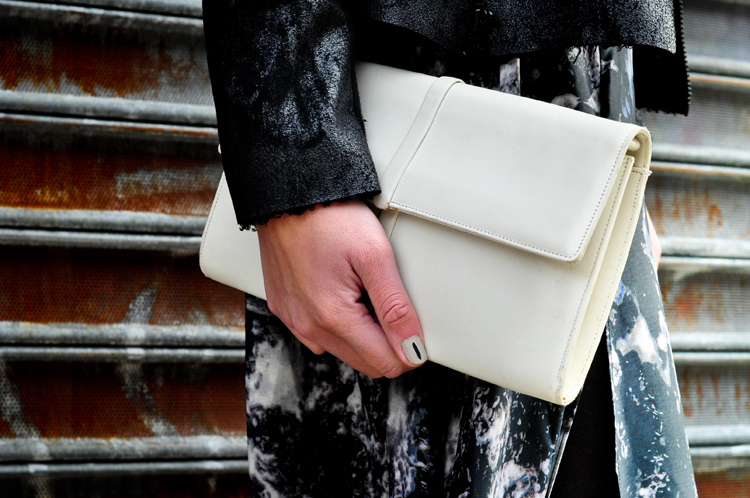 The styling here is perfection from the coat to the white bag and those nails..I need me some of those stick on's! Fabulous street style you have! How f'ing cold is it in NY..brrrrr! that dress!!! !love pure love..and love how you styled it! You look incredible! love the dress! - wish i could see the top of it! Gorgeous outfit, love the print on the dress and the shoes. love the dramatic look! thanks so much for following, got ya back! Amazing...the photographs are fantastic as usual and I love that dress. Very few people can wear hoiery and open toe shoes well and correctly like this. This is such a beautifully styled ensemble, love the dress and amazing boots! Absolutely love this outfit!! Stunning look. That is really cool. Thanks for finding it. Some really good ideas there, this is going to be a real time sink.